Weather Policy: The Grant Park Candlelight Tour of Homes will go on—rain or shine. The weather forecast predicts no ice or snow. Buy your tickets now! Advance tickets for the 2018 Candlelight Tour of Homes are $20 each through Friday, Dec. 7. Ticket prices increase to $25 each beginning Saturday, Dec. 8. Children 5 and under do not require a ticket. After Dec. 7, tickets must be purchased at the door. See “Tour Info” below for details. To inquire about special group rates (10+ people), e-mail our Chair, Don Wallace. 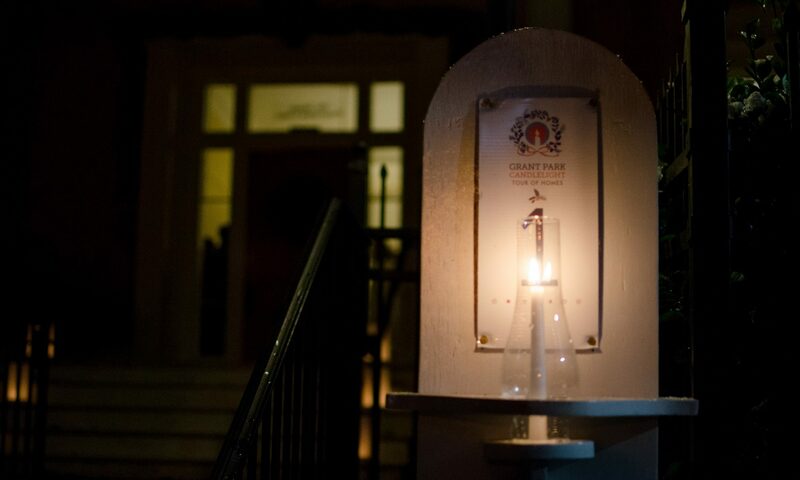 One of the most eagerly anticipated events of the holiday season in Atlanta, Historic Grant Park’s Candlelight Tour of Homes first began in 1980 as a benefit for a pioneering community daycare center. Over the years, the tour has grown and evolved into a fundraiser for three cherished community organizations: St. Paul United Methodist Church, the Grant Park Cooperative Preschool, and the Grant Park Parent’s Network. The Candlelight Tour traditionally takes place on the second weekend in December and provides an intimate and charming way to experience both the past and present of the historic Grant Park neighborhood. And you’ll soon realize that “Candlelight Tour” isn’t just a slogan, as you’ll be enchanted by the warm glow of candles and holiday lights at every stop. There is hardly a more delightful way to experience the Grant Park neighborhood, which was founded by Col. Lemuel P.Grant in 1885, and consists largely of original Victorian, Queen Anne and Craftsman homes that were constructed between 1885–1910. The Grant Park story is one of urban decay and renewal, as the neighborhood suffered catastrophic decline after the construction of I-20 in the early 1960s, which required the demolition of over 300 homes and businesses and divided the neighborhood North and South. A restoration trend began in the 1970s and gathered momentum in the 80s. In 1979, a portion of the neighborhood south of I-20 was placed on the National Register of Historic Places, which was then expanded north of I-20 in 1986. As the neighborhood rebounded into the 1990s, demolition of older homes was largely halted, and many large homes that were once subdivided into apartments were restored to single-family use. In 2000, the Grant Park neighborhood became Atlanta’s largest Historic District, bringing additional zoning protections, incentives for historically sensitive renovations, and the requirement that new construction conforms to the character of the old neighborhood. Grant Park today is a vibrant and diverse neighborhood with a mixture of long-time and new residents of every background. Come join us as we celebrate the holidays in Grant Park style! To begin the tour, all tour-goers must check in at the ticket table at St. Paul United Methodist Church, 501Grant St. SE, to exchange their ticket or e-ticket for a tour booklet. The tour booklet includes a map and descriptions of the homes on the tour and is your passport for entry to each of the tour stops. Tickets may be purchased on the days of the event at the ticket table for $25. Children 5 and under do not require a ticket. Cash and credit cards are accepted. Tour tickets include free trolley service, though tips for the drivers are encouraged. All sales are final and refunds cannot be given, but tickets are transferable. In the past, tour-goers typically drove to each of the tour homes and stops along the tour route, but with the new trolley shuttle service in 2018 we expect parking at and around St. Paul United Methodist Church (tour headquarters and origination point) to be extremely limited. Please consider carpooling or using a ride share service to the Tour. You may also consider driving to one of the tour stops after you pick up your tour booklet at St. Paul UMC; you can catch and ride the shuttle from there and then back to your car after you complete the tour. Don’t worry about booking a sitter! We’ve got childcare! Childcare will be provided by the Grant Park Cooperative Preschool (GPCP) staff and teens from St Paul UMC and is available for children ages 1 to 9 years old. The cost for tour volunteers is $25 for the first child and $20 for each sibling. For those not volunteering the cost is $40 for the first child and $25 for each sibling. Please note that the sign up is divided by age group, so make sure to sign up each child in the right group. Restrooms are available at St. Paul UMC (tour check-in) and at Saint John the Wonderworker.Restrooms are not available in homes on the tour. You can join our tour family by becoming a Season’s Greeter! Choose the Season’s Greeter ticket package at checkout and you’ll get two tour tickets and a special Season’s Greeter yard sign recognizing your support. We deliver the sign (within a five miles radius) and after the tour, we’ll come pick it up again. Help spread the joy! Experience Grant Park! Sample the wide and growing variety of wonderful restaurants and coffee shops in the neighborhood before and after the Tour. You’ll also find special food and drink offers from our local sponsors in your tour booklet, so plan to come early and stay late! After discussion with the Historic Oakland Foundation, we have canceled the Oakland VIP Experience due to the forecast of rain. For those of you who have already purchased an Oakland VIP Experience ticket, the Historic Oakland Foundation will provide a ticket for a tour of Oakland Cemetery that can be used in the future. We apologize for the inconvenience. Families are invited to attend Winter Wonderland! Created by the Grant Park Parent Network (GPPN), Winter Wonderland is an afternoon filled with holiday entertainment! Santa has promised to stop by for photos. Since this is his busiest time of year, he will only be able to meet with a LIMITED number of families. Be sure to arrive on time if you wish to see Santa. Visits with Santa are on a first-come, first served basis and slots go quickly! For more information about Winter Wonderland, please visit the GPPN Facebook Page. The children of St. Paul perform an original Christmas Pageant each year. A special dress rehearsal has been arranged for Saturday afternoon and is free and open to the public. Come hear and see the Wonder of Christmas through the eyes and hearts of our children. The Artists’ Market takes place in Chester Commons, adjacent to the St. Paul church sanctuary, which is where all attendees pick up their programs for the tour. For more information about the Artists’ Market, email us. Enjoy a festive pre-tour holiday party with award-winning craft beer and savory heavy hors-d’oeuvres at Grant Park’s own Eventide Brewing from 4:00-6:00 PM on Sunday, December 9. This is a great way to relax and socialize with friends, family, and neighbors before the Candlelight Tour. We had a great turnout last year and expect an even larger crowd this year. The Sunday VIP Experience Ticket is $30 each and includes the Eventide Brewing Pre-Tour Holiday Party and the Candlelight Tour of Homes, which provides one free Eventide beer and a selection of savory heavy hors-d’oeuvres from Cake Hag and Dakota Blue. The Eventide Pre-Tour Holiday Party VIP Experience ticket may be purchased online by Friday, December 7 or at the door of Eventide Brewing at 4:00 p.m on Sunday, December 9. Share the brews—um, news—with your family, friends, and neighbors! One of the highlights of the Candlelight Tour of Homes is our annual Candlelight Christmas Concert. The St. Paul UMC Chancel Choir and the Paulines will be joined this year by the Alexander Memorial AME Church Mass Choir. Performed in the beautiful and historic St. Paul sanctuary, this free concert will feature a wide variety of Christmas choral and ensemble music. You’re invited to celebrate the season with us and make this a memorable part of your Grant Park Candlelight Tour of Homes experience! If you’d like to partake of both VIP Experiences, purchase the Tree Topper Total VIP Experience, which includes the Oakland Cemetery Victorian Holiday Walking Tour on Saturday and the Eventide Brewing Holiday Experience on Sunday as well as admission to the Candlelight Tour of Homes on Saturday and Sunday. The Tree Topper Total VIP Experience Ticket is $40 each and must be purchased online by Friday, December 7.